The capital city of Odisha, Bhubaneshwar is regarded as one of the most important cities in East India. With a population of close to 1 million people, the city ranks high in terms of vehicle usage. The number of vehicles in the city has crossed 10 lakh, with a three-fold increase witnessed in the last decade. Two-wheelers account for a major portion of vehicles in the city, with 2/3rd of the vehicular population being bikes. This increase in vehicles has also resulted in a corresponding rise in the number of accidents. The city, which has over 7.5 lakh two-wheelers sees a number of road related deaths. As such, a good vehicle insurance policy is a must for road users. While the government has made it mandatory for all vehicles to be insured, it is the duty of the rider to secure his/her interests before hitting the roads. Insurance providers often tie up with local garages to improve their services. This enables them to streamline the claim settlement process, in addition to enhancing their customer base. Cashless garages enable an individual to get damages to an insured vehicle fixed without having to pay an amount, with the insurer directly handling the same with the garage. 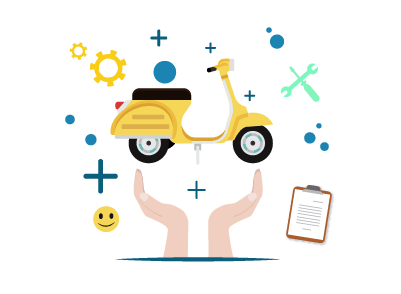 Get in touch with the customer support team of the insurance company and request them to provide a list of all network garages in a given area. Utilise the official website of the insurance company to search for network garages in the city. This is simple and easy, with one required to navigate to the section on network garages and enter the city/area where they wish to find a garage. Utilise the mobile app of the insurance company to search for a network garage in a locality. In cases where an individual purchased a policy from an agent, one can contact him/her to get details of network garages in the city. Certain insurers provide a list of network garages in the policy document/brochure. One can also utilise the services of third-party websites. These websites provide a list of network garages for a particular insurer in a said city. Hassle-free – The entire process of using a cashless garage is simple and efficient. One needn’t run pillar to post in order to avail the services of a network garage. All one needs to do is contact the insurance provider and submit a few documents. The insurance company will handle all communication with the garage post this. Minimal documents – On account of the partnership between the garage and the insurer, one needn’t submit a number of documents. Professional – Cashless garages offer professional services to customers. This is something one cannot expect from local garages, who are often known for their delays. One can be rest assured that the vehicle will be delivered on the date specified. Additionally, network garages hire the best technicians and mechanics, ensuring that the work is up to a set standard. Quality spares – It is possible for local garages to use fake/second-hand spare parts to increase their profit margin. This could lead to complications in the future, often resulting in additional damage to the bike. Cashless garages, however, are known for using genuine spares, offering peace of mind to users. Quicker – Network garages are known to complete repairs within a stipulated time. This enables one to plan his/her travel accordingly. Reduced spending – Getting damages fixed at local garages can be expensive. Garage owners are known for charging high amounts even for minor repairs. When one uses a network garage, this entire payment hassle is eliminated. The insurance company directly settles the bill with the garage, with payments from one’s own pocket required only if the cost of repair exceeds the cover amount. Additional services – Network garages offer services like towing, doorstep delivery of vehicle, roadside assistance, etc. Replacement bike – It is possible for some insurers to offer a replacement vehicle while the insured vehicle gets fixed at a network garage. This facility varies from insurer to insurer, with a few offering conveyance allowance during the period the vehicle is in the network garage. Purchasing a bike insurance is an investment, and as such requires certain research to ensure that it adds value. Here are a few points which should be considered before buying a policy. Type of cover – There are two cover options provided in India – Liability-only and Comprehensive cover. While it is mandatory to have a liability-only cover, the protection accorded by it is limited, covering only damage to third-parties. A smarter option is a comprehensive policy, for it covers additional scenarios. Claim settlement option – Insurance companies offer two types of settlement options, cashless and reimbursement. In reimbursement policies, the policyholder is expected to pay for damages, with the insurer reimbursing this amount. A cashless policy enables one to save time and effort. Premium – It is imperative that one compare premium rates before buying a policy. Insurance companies are known to offer discounts on their policies if the rider has no history of claims. The premium amount is computed after taking factors like the age of vehicle, engine capacity, city of registration, accident history, etc. into consideration. Policy term – Insurance providers offer policies which have a term ranging between 1 year and 3 years. One should choose the term based on his/her current requirements. A longer term is a smarter option, for this eliminates the hassle of periodic renewal. Additionally, these policies also come with a lower premium. Deductible – This is the amount the policyholder is expected to pay in case of a claim. The deductible has an inversely proportional relationship with the premium. The higher the deductible chosen, the lower the premium amount. One should choose this based on his/her riding experience and confidence. Limits on claim amount – There can be a limit on the amount one can claim. It is a good option to check this limit, for any amount in excess of this limit will have to be borne by the policyholder. Exclusions – Read all the terms and conditions of the policy before purchasing it. Each policy has a list of inclusions and exclusions. Common exclusions include damages due to war, natural disasters, consequential losses, etc. Claim settlement process – Opt for an insurance company with a good claim settlement record. This can eliminate hassles when it comes to submitting a claim application. Network garages – Ensure that the insurance company has a good network of cashless garages, with a presence in the city where the vehicle is to be used. Inform the Regional Transport Authority (RTO) about the sale of the vehicle. Initiate transfer formalities by completing the application form and submitting it. Request for a No Objection Certificate (NOC). Once this has been done, the new owner should ensure that the vehicle insurance is transferred to his/her name. Failure to do this can result in the insurer denying a claim in the future. Transferring the policy is simple, and can be done by following these basic steps. Inform the insurance company about the decision to sell the vehicle. Request them to initiate the process to transfer ownership of insurance policy. Provide details of the sale to the insurer. The buyer is expected to meet the eligibility criteria set forth by the insurer. Any fee, if applicable, needs to be paid. On completion of all formalities the insurance company will transfer the policy.